Dartmouth's BASIC at 50 anniversary celebration included a public panel discussion and Q&A with leading thinkers on the future of computing. Dartmouth Computer Science Professor Tom Cormen moderated the event, which can be viewed in its entirety here. Brian David Johnson is a futurist at Intel Corporation, where his charter is to develop an actionable vision for the future of technology. His work is called "futurecasting"—using ethnographic field studies, technology research, trend data, and even science fiction to provide Intel with a pragmatic vision of consumers and computing. Along with reinventing TV, Johnson has been pioneering development in artificial intelligence, robotics, and using science fiction as a design tool. He speaks and writes extensively about future technologies in the popular press and has authored four science fiction and fact books. 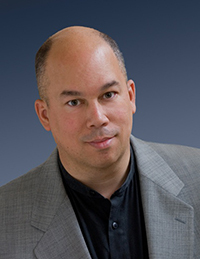 Johnson lectures around the world and teaches as a professor at The University of Washington and The California College of the Arts MBA program. 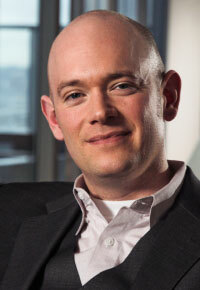 He appears regularly on Bloomberg TV, PBS, FOX News, and the Discovery Channel and has been featured in Scientific American, MIT Technology Review, Forbes, INC, and Popular Science. He has directed two feature films and is an illustrator and commissioned painter. Michael Jones is Google's chief technology advocate, charged with advancing the technology to organize the world's information and make it universally accessible and useful. Jones travels the globe to meet and speak with governments, businesses, partners, and customers to advance Google's mission and technology. He previously was chief technologist of Google Maps, Earth, and Local Search. Before its acquisition by Google, Jones was CTO of Keyhole Corporation, the company that developed the technology used today in Google Earth. He was also CEO of Intrinsic Graphics, and earlier, was director of advanced graphics at Silicon Graphics. A prolific inventor and computer programmer since the 4th grade, he learned to program in machine language using a Bell Laboratories CARDIAC computer simulator. He then discovered James Coan's Basic BASIC and his love of computing blossomed. He has developed scientific and interactive computer graphics software, held engineering and business executive roles, and is an avid reader, traveler, and amateur photographer using a home-built 4 gigapixel camera made with parts from the U2/SR71. Daniela Rus is the Andrew (1956) and Erna Viterbi Professor of Electrical Engineering and Computer Science and Director of the Computer Science and Artificial Intelligence Laboratory (CSAIL) at MIT. Previously she was a professor in the Department of Computer Science at Dartmouth. 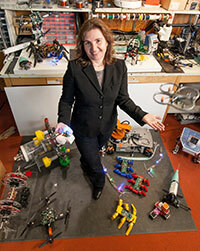 Rus's research interests include distributed robotics, mobile computing, and programmable matter. Rus is a Class of 2002 MacArthur Fellow and a fellow of AAAI and IEEE.